Don’t just stand there – go get wet and cool down this summer! Here’s a list of the water fun areas in Chicago’s suburbs. 1100 W. Wood St. The Water Park offers a new splash pad aquatic play area, zero-depth entry pool, a 155-foot water slide, a diving well with diving board and drop slides and a children’s water play area with sprinklers. There are also large sand and grass areas, a volleyball court, concession stand, picnic area, and a playground. *Print our coupon offer here! 200 S. Lindsey Ln. Huge interactive play area, lap and zero-depth pools, spa, parties and more. Check out our video online to see what a blast Pelican Harbor can be! 849 W. Lies Road. Lies & County Farm Rd. New spray n’ play water playground, 15-ft climbing wall, new toddler slide, the tallest water slides in DuPage County, dive pool and drop slide, new dry playground, five star life-guard safety rating, Rocco Vino’s poolside café, splashtastic birthday parties, special events. Open June-Sept., 11am-8pm Mon-Sat: 11:30am-7:pm Sun. 300 N. Kennedy Drive (Route 68 & 25). 7820 CherryVale North Blvd. (Interstate 90 and Highway 20). 200 Rev. Morrison Blvd. Open May-Aug, Tropical paradise of excitement. Zero-depth leisure pool, vortex pool, tot pool, tube ride, 4 giant body slides, 3 story funhouse and more! Enjoy a meal at the hide-a-away café or have your picnic in coconut or mango grove. *Print our coupon offer here! Wolf Rd., 2 blocks north of Butterfield Rd. 1825 Short St. Discover a nationally recognized and award-winning Aquatic Park the whole family can enjoy! 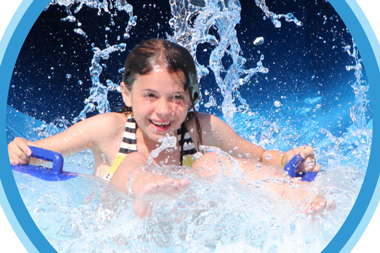 With two 50’ body flume slides, a vortex pool, splash playground, sand and kiddie water play area, teen pool and more. There is something fun for everyone! Birthday parties and pool rentals are available. Please visit our website for hours and fees. *Print our coupon offer here! 437 E. St. Charles, Rd. 500 W. Jackson Ave. Experience one of Naperville’s most unique and historic facilities! This recently renovated venue features a large swimming area with zero-depth entry, a sand beach, the Centennial Grill, family changing rooms, deck-level restrooms and much more. *Print our coupon offer here! 5 Ashland Ave. A great place to party and play with a flume waterslide, two drop clides, zero depth pool, play fountains, sand play area and more. 340 East Palatine Road and Northwest Highway. 110 West Camp McDonald Rd. 505 N. Springinsguth Rd. Jump in and experience our three water slides, rapid water channel, water playground, diving pool, lap pool, whirlpool & more.